Sue qualified in McTimoney Chiropractic at the end of 2003 and opened the Fir Tree Clinic in January 2004. Her earlier careers were quite different from what she is doing today. Sue's first degree was in Maths and Computer Science and her first jobs were as a software engineer writing software for naval systems and the aerospace industry. She went on to become an IT and business consultant working in local and central government and then in the banking industry, She was encouraged by her own chiropractor to retrain as a chiropractor and has never looked back! Stephen qualified as a chiropractor after working for nearly twenty years in various companies including British Aerospace, Racal and ICL/Fujitsu. After receiving McTimoney Chiropractic treatment from a practitioner with a similar background, he was inspired to follow that path and spent the next five years training at the McTimoney College in Abingdon. He is also qualified as an osteopath and in sports and remedial massage.Stephen is registered with the GCC and GOsC and is a member of the McTimoney Chiropractic Association . He has been offering osteopathy and chiropractic from the Fir Tree Clinic since 2010. 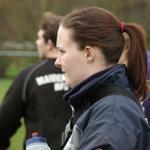 A keen rugby enthusiast, Cat is currently working at Reading Rugby Club providing training nighttreatment sessions, rehabilitation classes,pitchside assistance for the 1st XV and co-ordinating youth medical cover provision. Since completing her degree Cat has furthered her knowledge by completing regular Continued Professional Development to keep up to date with current research and treatment protocols. In the future she is looking to widen this with a master’s degree in sports rehabilitation.